Hidden Valley serves them with their Original Ranch Dressing; we’re making a nonfat yogurt dip. Prep time is 15 minutes. 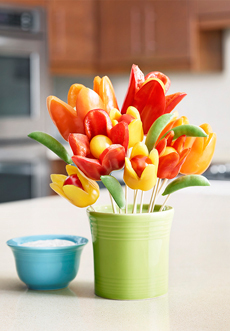 Take an artistic approach to crudités with this vegetable bouquet (photo courtesy Hidden Valley). 1. MAKE the dip (recipe below) and chill in the refrigerator until ready to serve. 2. WASH and seed the peppers. Cut jagged edges into the tops. 3. STICK the snap peas on the skewers to create the leaves. Insert the skewers through the bottoms of each pepper and put the tomato in the center as shown. Arrange in a flower pot, vase or on a plate. This recipe can be served as a dip with crudités, pretzels and other snacks, or as a topping/sauce for grilled fish, meat, poultry, even burgers. You can also mix it with boiled potatoes, macaroni or shredded cabbage for a fat-free potato salad, macaroni salad or cole slaw. Or sweeten it and use it as a fruit dip. The recipe makes a small bowl of dip, or 4 sauce servings for a main course. You can use your creativity to mix and match the seasonings to your main. 1. BLEND the yogurt, garlic, lime juice and ginger in small bowl. Cover and refrigerate at least 30 minutes or up to 2 days. 2. REPLACE the herb with grated lime zest or other citrus zest (lemon, grapefruit). *The Hidden Valley recipe combines 1/2 cup Original Ranch Light Dressing and 8 ounces softened fat-free cream cheese, chilled until ready to serve.